When all players have played two of their three cards they all get the opportunity to bribe a character with one coin. Three character cards with different abilities are open on the table. Some characters give the players extra money or influence cubes, or allow them to perform an extra action, but the majority of the characters can be used to score victory points when certain conditions are met. For example, when bribing the Guard, you get one point for each influence cube in your district. Each character card also depicts a number of rats; at the end of each round, the rat counters of the players advance as many spaces along the track as there are rat icons on the three character cards. If a player has more than 9 rats, the Plague enters his district. 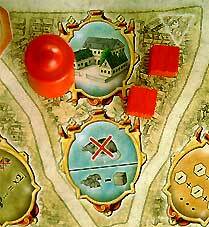 As punishment, he has to return two victory points to the stock, and remove one cube from his district. For the next round, three new character cards are placed on the table, and all players draw three new action cards from their decks and proceed as in the first round. After three rounds, all nine action cards have been used. At that moment, extra points are awarded to all players with influence cubes in the Notre Dame, and all the action cards are reshuffled. In total, the action card deck is used three times, so there are 3x3 rounds. At the end of the final round, everybody counts his victory points, and the player with the most points may call himself the most successful citizen in Paris! In 'Notre Dame' there are numerous ways to score points. This has the advantage that there are many different tactics and strategies that can be explored, which keeps the game interesting also for regular players. A disadvantage, however, is that you get the feeling that you lack focus, because you are overwhelmed by the many possibilities. This is something 'Notre Dame' has in common with 'Puerto Rico'. A big difference with the latter is that in 'Notre Dame', the blind deck of action cards introduces a significant element of luck. A specific card can turn up, or not show up, at a particularly bad moment. In addition, you have to give away two of the three cards you draw to your left neighbour, which is particularly annoying if you drew three good cards: no chance of ever seeing those again! And it remains to be seen whether you receive any decent cards from your right neighbour… The passing on of the cards to your neighbour suggests that you can use this to strategically take control of the options of your opponents, but since you draw three cards and give away two of those, you are extremely limited in your options, and there is not much interaction between the players. Whether you end up with three cards that you can actually use depends largely on luck. 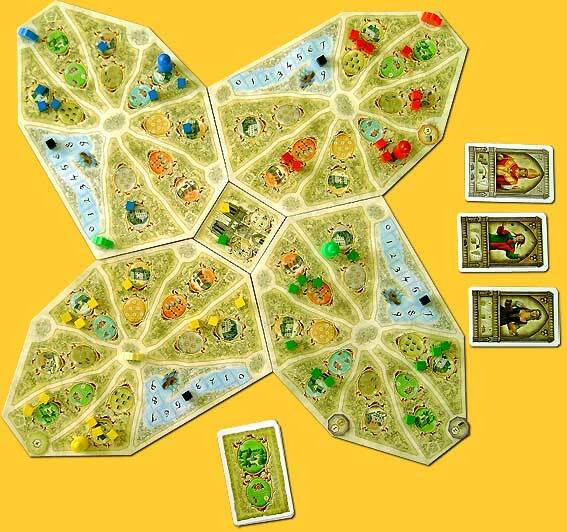 'Notre Dame' is a very nice game to play, and it also plays well with two players. The game has a very good look, a nice atmosphere, and plays in little over an hour. For those who don’t mind a little bit of luck, 'Notre Dame' is highly recommended.